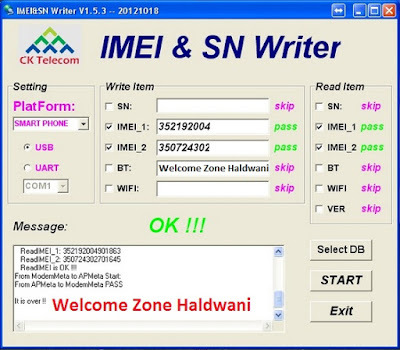 MTK IMEI REPAIR SN Writer Tool is a best Solution for repairing IMEI in all MTK android Smartphones without box and any other special software, just you need a DB file (database file) according to the mediatek cpu IC . NOW A DAY, NOBODY IS NOOB EVERYONE CAN REPAIR THEIR MOBILE BY THEIR OWN,[BY WELCOME ZONE HALDWANI]BUT THE MAJOR PROBLEM IS FIXING IMEI NUMBER WHILE REPAIRING THE MOBILE. ANDROID USER CAN FIX/UNBRICK THEIR DEVICES IF ITS SOFT BRICK OR AS WELL IF ITS HARDBRICK BUT MANY OF ANDROID USER DON’T KNOW HOW TO RECOVER IMEI NUMBER. SO HERE I AM WITH MY NEW POST FOR ALL THOSE WHO WANNA FIX THERE IMEI BY THEIR OWN.